"Give me that mic," Jennifer Lopez said. The 16-year-old high school student from San Diego who powered through the Jazmine Sullivan ballad "Stuttering" on Wednesday, was revealed to have received the fewest viewer votes on Thursday. 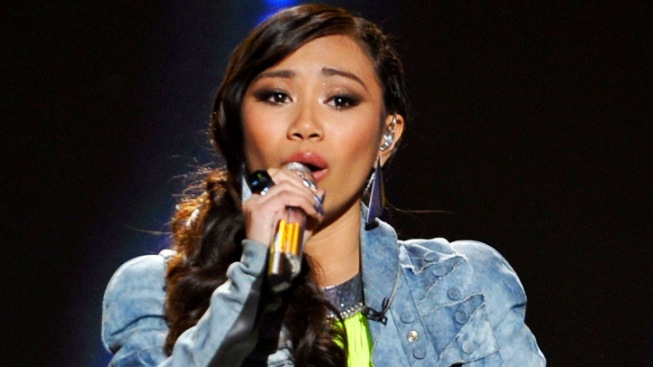 The "American Idol" judges didn't stutter: Jessica Sanchez "ain't going home." The 16-year-old high school student from San Diego who powered through the Jazmine Sullivan ballad "Stuttering" on Wednesday, was revealed to have received the fewest viewer votes on Thursday, but the "Idol" judges unanimously decided to save Sanchez before she could even finish her last-chance performance of Deborah Cox's "Nobody's Supposed to Be Here." "Give me that mic," interrupted Jennifer Lopez. "This is crazy! Yes, we're using the save. You ain't going home." Sanchez, sometimes known as her sassy alter ego "Bebe Chez," had been deemed one of this season's front-runners, consistently impressing the panel with savvy-beyond-her-years takes on such tunes as Whitney Houston's version of "I Will Always Love You" and Beyonce's "Sweet Dreams." Elise Testone, the rockin' 28-year-old teacher from Charleston, S.C., who sizzled with Lady Gaga's "You and I," and 20-year-old student Joshua Ledet, of Westlake, La., who earned a standing ovation from the panel for Bruno Mars' "Runaway Baby," joined Sanchez as the bottom three vote-getters. It was the first time at the bottom for Sanchez. "This is a ridiculous bottom three, America," said Randy Jackson. Thursday's results surprised even longtime "Idol" host Ryan Seacrest and executive producer Nigel Lythgoe. Earlier in the day, Seacrest tweeted: "There is a result tonight on 'American Idol' that some would say is very shocking." Lythgoe later reiterated the sentiment, posting on Twitter: "I am truly shocked by tonight's 'American Idol' result! I don't understand!" Three seasons ago, "Idol" producers introduced the ability for the show's judges to overturn viewers' votes one time before the top five finalists are selected. Rescuing the technically impressive singer this week means two contestants will be booted next week. "I want people to know I've been working hard my whole life," said Sanchez after her bailout. Before the results were revealed, the top seven finalists performed Pink's "Raise Your Glass," 10th season finalist James Durbin delivered his original tune "Higher Than Heaven" and third season finalist Jennifer Hudson sand with Ne-Yo on "Think Like a Man." The other singers remaining in the competition are Hollie Cavanagh, 18, of McKinney, Texas; Colton Dixon, 20, of Murfreesboro, Tenn.; Skylar Laine, 18, of Brandon, Miss. ; and Phillip Phillips, 21 of Leesburg, Ga. The seven finalists will return to the stage Wednesday and face elimination again Thursday.